The ‘official’ Number 1 in Malaysia is Proton, the government backed automaker; however, as reported a few weeks ago by roving editor at large John Weinthal, the ‘real’ Number 1 is Perodua, outselling Proton, and having 39 percent market share mid-year 2007. However, Perodua denies any thoughts of export to Thailand, saying they are already flat strap keeping up with local production, but Proton have said they are coming here and are in throes of setting up a dealership network in this country. One of the models which will be offered here is likely to be the new Satria. Proton has not had a good name as far as ‘quality’ is concerned, but with the launch of the Satria Neo it has shown its commitment to lifting its game through certification with the TUV Rheinland Group - an organization that looks at compliance engineering, testing and quality. A road test of the Australian-bound Satria Neo, particularly in GXR form as dealt with here - showed it is well fitted out. In fact it is exceptional in some ways, with rear park-distance monitors, climate-control and even a rudimentary trip computer part of the standard kit in the up-spec model. The mechanical layout is pretty straightforward: a 1.6-litre DOHC, 16-valve four-cylinder dubbed CamPro by Proton and producing a quite healthy 82kW, the choice of five speed manual or a four speed auto and an independent suspension system with MacPherson struts up front and a coil sprung multi-link layout at the rear. All disc brakes with ABS and EBD are nice to have, and compliment the Lotus tuned suspension which can probably be counted as a distinct point of difference with other cars of similar size. No question the Neo is a good-looking little hatch - a sort of spiritual successor to the mildly iconic Satria GTi hatch that was available until 2005 - with a nicely resolved, appealing look that keeps well short of the practical, upright shapes in many of its competitors. This is helped no end by the decent 16 inch alloy wheels fitted to the GXR. 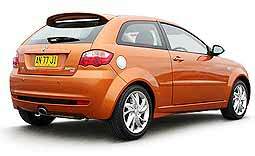 The turbine-look multi-spokers combine with a blended in roof spoiler to visually legitimize Proton’s claim the Neo is a genuinely sporty light hatch. The boot is a reasonably useful 257 liters, but the little hatch gets only a space-saver spare. The good impressions continue inside, where everything looks a bit more upmarket than we remember of the previous Satria. A closer look reveals what is still a pretty basic, superficial approach to details though, with hard-touch vinyl and silver-painted plastic dominant. The seats are a nice surprise, with pleasantly supportive side-padding and generally comfortable shaping. The driver’s seat is height-adjustable too, although it never gets low enough to be really suitable for a tallish occupant. And the steering wheel, though it contains on-spoke controls for the sound system, can be set for height, but not reach. Unexpectedly, there’s not a lot of space for storing small items around the cabin. There are a couple of Yaris-like holes either side of the center console that can take things like mobile phones, and a couple of cup-holders, but not much else apart from your regular glove box and rudimentary front door pockets. But it all looks okay, and Proton has done a pretty good job of ensuring that there is some tactility in the way the controls work. In the front, there’s ample comfort for average sized drivers and passengers, but in the back, with the short wheelbase, there’s precious little legroom even if the shoulder width isn’t too bad. Headroom is an issue here too. The low ‘sporty’ roofline takes its toll. Cruise control (auto transmission only) is also part of the deal with the GXR, while it shares standard ABS braking, rear reversing sensors, dual front airbags, four speaker Blaupunkt audio with single, MP3 compatible CD player, a 60-40 split rear seat, and all power windows and rearview mirrors with the GX. The main game for the Neo is undoubtedly the driving, once again especially in the GXR that gets 195/50R16 tyres wrapped around its alloy wheels to produce decent road grip and sharp responses from the steering - which goes from lock to lock in a pretty tight 2.7 turns. The GXR Neo rides firmly but generally manages rough patches okay. 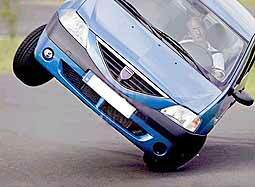 You could say the suspension is one area where the Proton stands out in its class. This, and the fact that the body feels taut, as the company suggests, helped along by the dramatic increase in body stiffness over the previous Satria with its claimed class-leading rigidity of 14,000 n/mm. The specifications of the 1.6-litre engine combine with a relatively light all up weight of 1169 kg to suggest fairly healthy on road accelerator response and this proves to be the case - within certain limits. If you want a little more from the engine - say a decent shove of mid-range accelerator response, or a bit of extra squirt at the top end - there’s a certain lifelessness that indicates that, in this age of variable valve control, we are maybe getting a bit spoiled. The CamPro 1.6 does its job, but nothing more - although it at least does it with relative smoothness and silence. That the official zero to 100 kmh acceleration time is quoted at a relaxed 11.5 seconds is not surprising - although the fact this can only be achieved with 95 RON fuel comes as something of a shock. The average fuel consumption claim of 7.2 L/100 km for the manual (7.6 L/100 km for the auto) is acceptable, if still nothing special. The main competitors, many of which are not coming here, or will be coming later, include Mazda2, Suzuki Swift, Ford Fiesta, Kia Rio, Citroen C3, Honda Jazz, Mitsubishi Colt, Peugeot 207, Toyota Yaris and Volkswagen Polo. 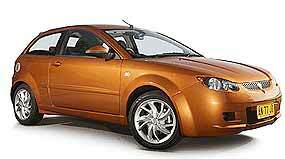 The new Jazz for 2008 could probably be its nemesis, and Mazda 2 and the Fiesta will be the newcomers. However, it is good that in Thailand we are slowly being given more of a choice. For that reason, if nothing else, I applaud Proton for what they are doing in the local small saloon car category. Last week I asked which Lotus driver won a three hour sportscar race by driving the car across the line on the starter motor? It was a Lotus 19 and was driven ‘electrically’ across the line by Dan Gurney. He was leading the 1962 Daytona 3 Hour by many laps when the engine failed, so he waited at the line until the three hours were up and when the flag came out ‘ground’ it across the line to win, as he had been so many laps in front, the rest of the field couldn’t catch him. So to this week. One central headlight was seen on many cars over the years, the revolutionary Tucker Torpedo being a classic example. However, there were many before that. What was the first American car with ‘cyclops’ headlights? The FIA (the world’s governing body for motor sport in general and Formula 1 in particular) have announced that the current restrictions on engine development will be extended to a 10 year period. At the start of this season’s championship an engine development freeze was placed on F1 in the hope of reducing the costs of competing in the sport, but now the World Motor Sport Council has put through a new 10 year freeze. Honda must be happy. They will have to keep going with the 2007 hand grenade engines for another 10 years! They may as well give up now. Another incredible step by the FIA. How can F1 be the pinnacle of engineering with 10 year old engines? Simply amazing. At the current Tokyo Motor Show, Carlos Ghosn indicated that as well as bringing back the legendary GTR super car, they were also going to build a $2,500 (under 100,000 Thai baht) car for India and other emerging nations. This will be built in a joint venture with Indian electric rickshaw and motorcycle maker Bajaj Auto Ltd. There are 45 million scooter drivers in India, so that is the size of the niche market. You don’t get ESC at this price! Renault already has a cheapie in India (and many other parts of the world) called the Logan, but the Bajaj is another quite separate venture and half the price. Thierry Moulonguet, Renault CFO and chairman of the Nissan-Renault management Committee for the Americas, told reporters in Japan that the automaker is positioning itself for an expected surge in small car sales globally. Moulonguet said engineers and designers are working on the second-generation Logan due in 2012 that will cut costs by 15 percent of the original Logan, which has a starting price of about $5,000. Renault now builds the Logan as a global car. The first sedans came from a factory in Romania. Since then, Renault has opened Logan plants in Russia, Colombia, Morocco, Brazil and Iran. Along with the plants, Renault has attracted and developed a local supplier base for the Logan as well as other models, including some yet to come. This year, it claims it will sell 800,000 Logan models. “Today we sell 80,000 in Western Europe while our initial expectation was zero,” Moulonguet said. All the signs are there that Ford Motor Company is getting a trifle desperate. Aston Martin has been sold, and now Jaguar and Land Rover are on the block. How the mighty has fallen. It is a shame really, because without Ford, the name Jaguar would have been consigned to the ‘remember them’ bin many years ago, and likewise Land Rover. The latest offerings from both those stables are good cars, but Ford has enough problems at home in the US, without the British worries. Ford has said they expect to complete the sale of both within two months. There are apparently more than a couple of financial institutions interested in purchasing them. This is always a worry when bean-counters take control, and not car people with automotive souls. Of course, this has prompted questions about FoMoCo’s other overseas marque - Volvo. Will it be next? The answer is “probably” in my estimation. Remember the definition of an optimist. It’s someone who takes their lunch to work!